After being away from Jordan for 2 months, it is now time to get back to reality and focus on my beautiful city Amman. 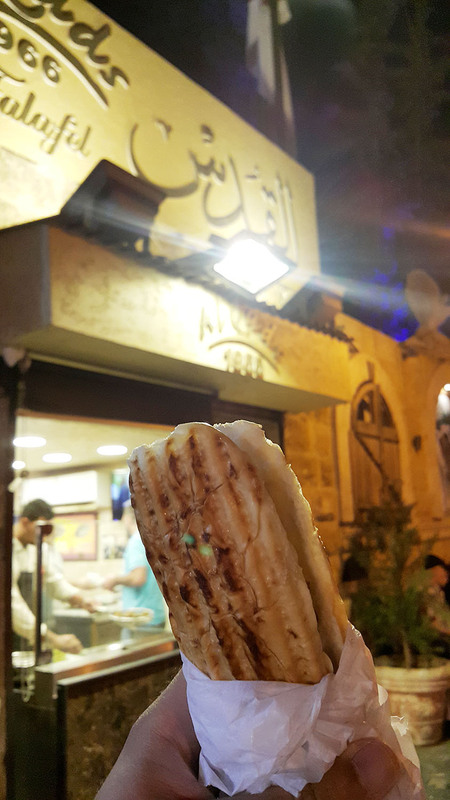 What better way to do it than spend a night in Downtown Amman? My friend Two Can Dine has informed me about this new app called Grabbd which allows you to create a personal profile to search for restaurants around you, and grab food items you want to try, or rate others that you tried whilst allowing your friends to see which restaurants you liked, and what food items you would suggest. What’s amazing about it is that its international, and you get to create a wishlist of restaurants or items you want to grab when you travel. Lucky enough, Two Can Dine and I met to get to know the Grabbd app in Amman this week, and share the places we liked. It was one of the best nights we had spent in a while. We were on a mission to spend a truly Ammani authentic night, so we made sure to have Falafel and Knafeh on our list. 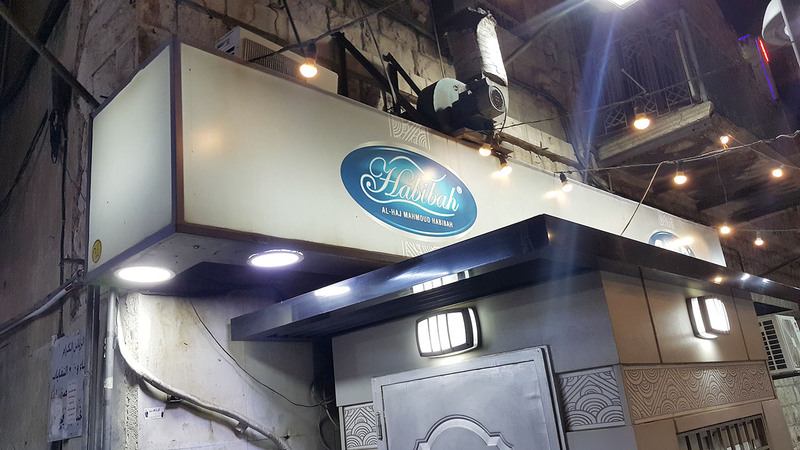 Our first journey started at one of the oldest Falafel parlors in the city, Al Quds Falafel in Rainbow Street. We were lucky enough to find a parking spot very close to the shop, as the street is usually packed. 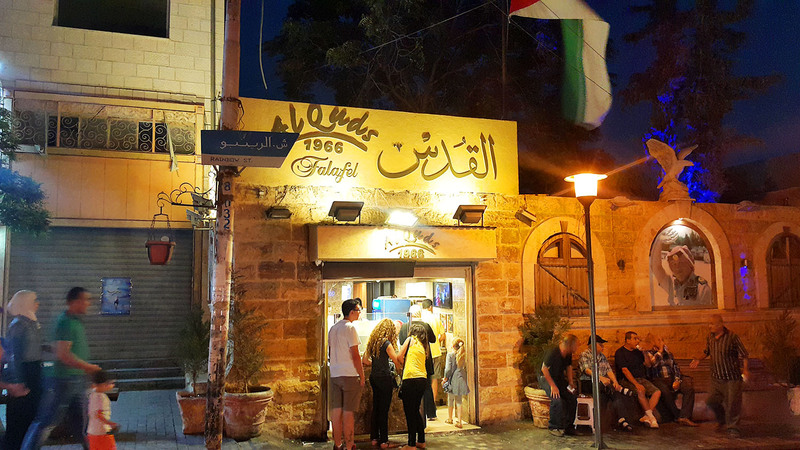 Established in 1966, Al Quds Falafel is considered a historic spot that everyone knows. It has been visited by many celebrities and members of the Royal Family. I personally consider it to be the most delicious and fresh Falafel parlor in the city. It is known for its simple menu, cleanliness and consistently amazing taste. 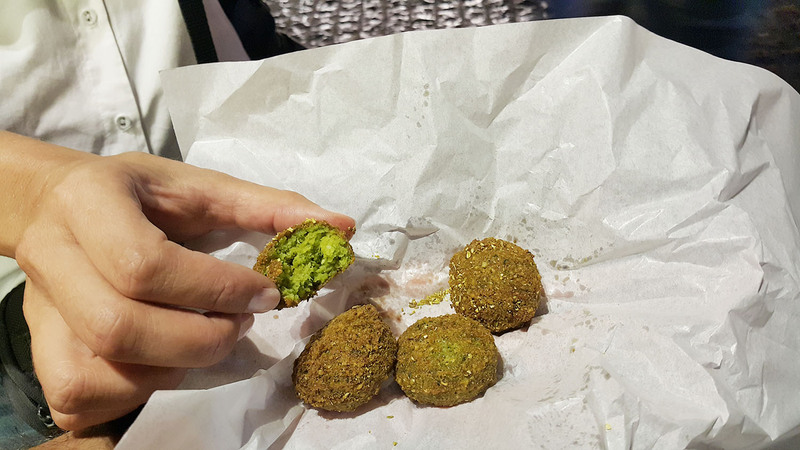 Not only that, but their Falafel is the only one in Amman that looks pure green when cut in the middle, showing how fresh and well prepared it is. The menu offers 2 items, which are Falafel in Sesame Ka’ek Bread (similar to Baguette), or Falafel in plain Ka’ek Bread. The Falafel is usually prepared with Tahini sauce, tomatoes and a choice of Shata (hot chili sauce). Unfortunately, Al Quds Falafel does not sell individual Falafel pieces like all other Falafel shops in Amman do. Yet, the gentlemen who worked there was kind enough to provide us with a few pieces of Falafel to enjoy whilst waiting for our sandwiches to be prepared. Once our sandwiches were ready, it was a hunger game! We made sure to enjoy every single bite, as we ate on the benches next to the shop. 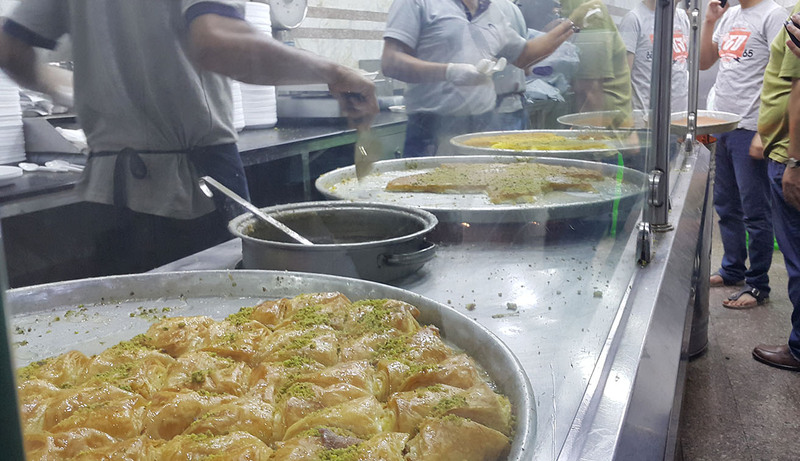 Once our bellies were three quarters full, we decided to embark on the next journey to Habiba Sweets in Amman’s old downtown in order to have the best Knafeh dessert in town. Another historic location to head to and enjoy a delicious treat at. 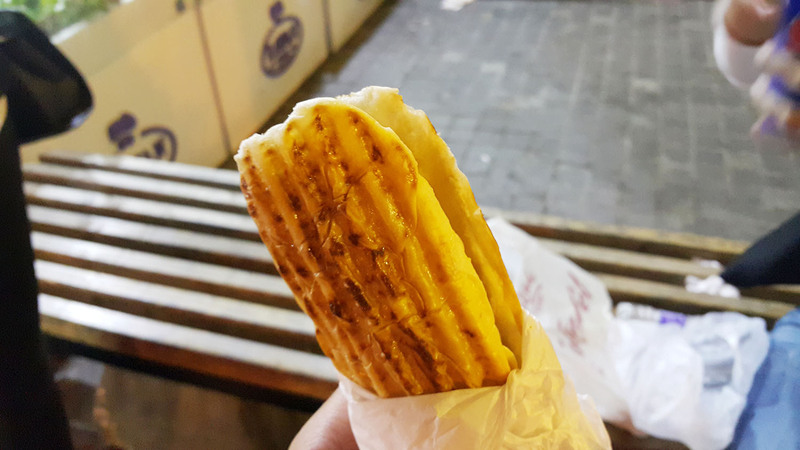 Upon arrival to Habiba, you are stunned by a long waiting line of people who are ready to wait for a piece of this delicious mouthwatering dessert. Nonetheless, once we got in line, it surprisingly moved fast, and we were able to place our order and take it quickly. Two Can Dine and I wanted to try both the Knafeh Na’meh (soft Knafeh), and the Knafeh Khishneh (rough Knafeh). 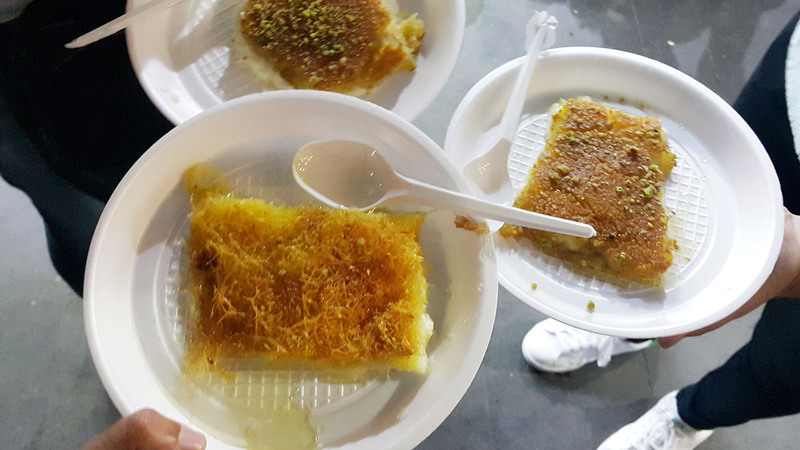 They are all the same except for the topping of the Knafeh in which one is soft and the other is more rough. Habiba also offers other desserts such as Ossmaliyeh, Warbat, and many others that should not be missed if you have room in your stomach. Two Can Dine and I truly enjoyed browsing the Grabbd team, and I had a very smooth user experience with it. Two Can Dine even took the time to show me in details how the app works on iPhone, as I am still waiting for it to be launched soon on Android. Again, I have to state – Android for life! Sorry Apple users.